This is an OS inspired from Gopi Geet (Link and Translation) from Srimad Bhaagvatam, and Ramanand Sagar's Shree Krishna. I was just listening to Anuradha Paudwal's rendition of the Gopi Geet when I thought of the incident before and after the same, and I thought of writing it down in my own words. Hope you like it. Three months had finally passed and it was spring. The full moon shone serenely illuminating the gardens. The lake was still and a gentle breeze blew through the lush green fields of Vrindavan. Krishna, looking out of the window thought- it's time to fulfill the promise he had made to the cow-maids three months back. He glanced at the shining moon, and then at the glistening waters of Yamuna. He began to play his flute. The sweet music danced forth in the wind and pierced the hearts of the cow-maids and the ears of their husbands. The cow-maids rose immediately and rushed towards the doors of their houses singing about their Lord, Krishna. One of them left a boiling pan of rice on the fire; one left her half-fed child on the bed and the other came out of the house thrusting the fan on her sleeping husband's face. Some of them were stopped by their husbands and other family members, but still they managed to run out. Their family cursed and shouted after them, but nothing could stop them then. And, how could they? It was none other than Krishna and his magnetic flute that called them! "Shyaam! Ghanashyaam! The one of a complexion similar to that of a nimbus-cloud!" said one, while the other shouted out to the sky, "Manmohan Govind Hari!" Their hair flew out in the air like the tattered flag of a deserted kingdom; their clothes hung from their waists and the ornaments fell on the dusty ground. They walked on without noticing their condition! How could they when the flute of the supreme summoned them? The cow-maids saw Krishna, sitting on a rock near Yamuna, immersed in his own ocean of melody. His anklets glistened in the same way as the white and pure sand did. He wore a shining yellow garment, while a thick garland of fragrant forest flowers hung from his neck. His waistband shone as brightly as his armlet. The wristband he wore was made of gold with intricate designs of an elephant carved on it. His earrings were of the shape of a fish, which dangled sideways as he moved his head from right, to left, and then to right. His closed eyelids looked like a petal of a freshly bloomed lotus. His lips, reddened with betel continuously blew new tunes- some lively and some serene. His thick and curly hair was tied into a bun near the top of his head, surrounded by a golden headband, topped by a peacock feather. The cow-maids looked at him in awe, but the Lord played on without noticing them. The cow-maids settled down near his feet, and stared at him with love-struck eyes. They were amazed as to how the boy never ceased to enchant them. Slowly, Raadha started to sway mildly in the music, which soon changed into a dance. Soon enough the other maids joined her, and they formed a circle around him, and praised him in verses, keeping harmony with the divine flute. The disarrayed voices brought Krishna back to senses. He immediately stopped playing his flute. He looked around him, at the girls who danced and spoke disconnected words, all in praises of him. In the next moment he dissolved into peals of laughter, seeing the pathetic condition they were in. He spoke to them in a mischievous tone, "May I please ask that why have you all assembled here at the middle of the night? It seems like King Kans has just let you people out of a mental asylum of Mathura, into Vrindavan, to deprive me of my peace and dear life!" A cow-maid came up, concerned, "God save your life, Krishna!" Krishna retorted, "Yes, I will indeed save my life. But good gracious! Don't you think you should have worn something more than what is presently covering you? And, my darlings, if you think that my Mother is going to supply you with dresses, then you are grossly mistaken. For now, the best advice I have for you is that you go back to your respective homes before your husbands come after me." One of the cow-maids said, "Krishna! How can you be so cruel? We have all abandoned our husbands and family. We have abandoned all our sense of morality, and accepted you, the one who we cuddled when you were small, as our Lord. All because you called us with your maddeningly bewitching flute! And you tell us to go back! How can you?" Krishna said with a mock exasperation, "Hey you liar! When did I call you? I was simply playing my flute!" A Gopi rose to say something, but her love and shock overpowered her voice, and she swayed her hand vigorously and twirled and fell at his feet. Krishna laughed, "Fine, fine! I understand. Get up! Now listen to me all of you, gather a pair of sticks each and make a circle. I'll teach you a new game. It shall be called the play or the dance of love, i.e. Raas Leela." The cow-maids did as they were asked to, without a single question. Krishna came to the centre of the circle and said, "Now, beat the sticks one against the other, in taal, while turning to your right each time. Good! Now beat the stick in your right hand with the stick in the right hand of the girl beside, and turn. Very good! Continue like this." Saying thus, he turned to Raadha, and said, "Raadhe, lets follow them now!" The trees swayed and river splashed on the bank, all ecstatic to see the divine dance. 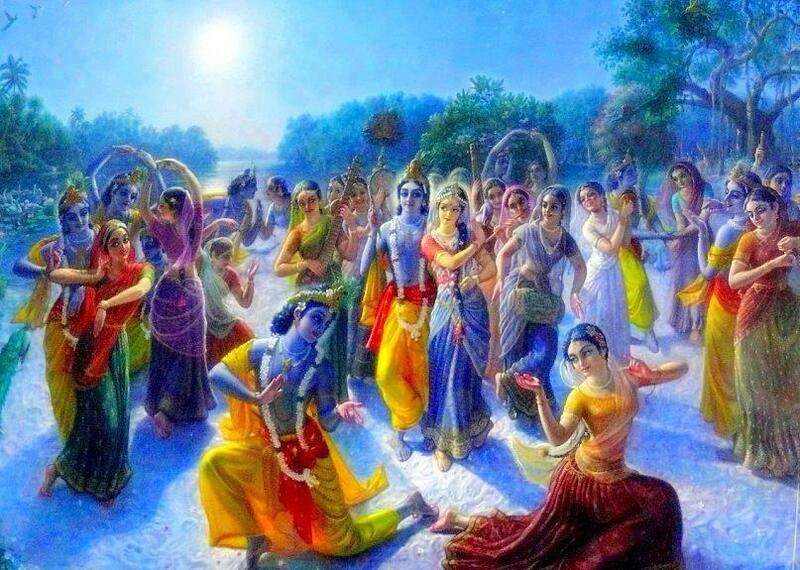 But soon, the Gopis realized that Krishna was busy dancing with Raadha, not paying any attention to them. Immediately they stopped dancing and rushed to him. They said with tears rolling out of their eyes, "Krishna, you cheater! Hadn't we gone through the same penance as Raadha? Hadn't Mother Yogmaaya given us the sane boon as Raadha, to enjoy your company all through the night? How can you violate the Mother's boon like this?" Krishna smiled, "I'm sorry, girls, I will definitely fulfill the Mother's boon! Go back into the circle and chant the praises of the divine Mother. You will be satisfied." Soon they were back in their previous positions. Krishna smiled at the nave cow-maids, and closed in eyes in meditation. He summoned all his powers and multiplied himself. Soon there were as many forms of Krishna as the Gopis. Each Gopi could though see only her own Krishna. All the forms bowed down in front of the cow-maids and said, "Please guide me! I, being a boy know nothing of dance, so I'll do exactly as you tell me to!" The cow-maids were overwhelmed with the simple gesture, and soon the forms of Krishna, in the literal sense, danced to the tunes of the pure and pious Gopis. But soon enough, the Gopis developed a fine sense of pride. They said to themselves, "Krishna loves me the most! I'm the one who is the most pure and the greatest devotee." Krishna saw this and was deeply hurt, he said to a peacock close to him, "Dear, dear! What has happened to my lovely sweethearts! They are arrogant! I need to immediately cure them of this fatal disease. Oh Mother, what should I do?" tears rolled out of his eyes, "Fine. If they think I'm only theirs, then let them face the truth." And saying thus he vanished from the face of the Earth. When the Gopis realized what had befallen them, they cried, tore out their hair and beat their chests and cursed themselves. Then they began to enact the different incidents of the Lord's life. They lamented, "Oh that I had discarded my pride before! O Krishna, come back! Do not desert us like this, bumblebee, have you seen our Kanhaiya? O the blades of grass, do you bear his footsteps, O Krishna come back! You are the greatest, the dark clouds, in the deserts of our lives come back! Please show your sweet face, or else we'll die, come back O Flute-player!" Seeing his plan successful and taking pity in their condition, Krishna reappeared at the riverbank, and said, "My dearest Gopis, here I am! Come back, let us dance again. Come!" This time the dance was more pure, and filled with more love. The demigods, nymphs and the yakshas all appeared in the sky and showered flowers on the Supreme Lord and his blessed Gopis. Lord Brahma said to Sage Narad, "Son, this is not merely a Raas Leela. It is the Maha Raas Leela! See how the atma [soul] of the Gopis is slowing merging into the paramaatma [supreme]. And see there, Krishna is dancing with Lalita, here he is, with Vishakha. There he embraces Rangadevi, and just see how he kisses Chitra! Narad! Look at the centre of the sphere, there is Krishna, my Lord, with Raadha. They are beyond comprehension Narad, so don't try to understand what spell he cast, just see, how the Gopis have emptied their body and minds, just like the flute of my Lord! And now they play the very music the Lord wants to hear, and in turn controls the Supreme!" Slowly, yet steadily the night went by. Surya, the Sun-god arose. Krishna looked at the exhausted Gopis, their braids were loose, their garlands were tattered, and their faces filled with perspiration. He himself went around wiping the sweat off the faces of the Gopis and made them drink the nectar-sweet water of Yamuna. He helped them to stand up, and walk towards their home. When the Gopis came back to their consciousness, they were shocked, and they returned to Krishna, crying. When Krishna asked what the matter was they said, "Krishna, yesterday night, all of our families had sworn in the name of the Lord, and disowned us. We cannot go back to our homes! Please do not abandon us! If you do not accept us then we would have no choice other than to end our lives in the dark waters of Yamuna!" Krishna smiled and said, "Do not fear ladies, go back. By my grace, your family members do not remember a single detail about the last night, and they will accept you with as much love as they had when you were wed into their house." Thank you so much Semadi!! Yes, Kanha can go to any extent to please his devotees!! And yes, don't know about others, but he definitely makes me dance!! Very beautifully conceived and written,my dear, bringing out in full the intensely spiritual quality of the love of the gopikas for Lord Krishna. For Krishna's intense love also held intense detachment. Yes, and the illustration you have chosen is also exquisite. It suits the text perfectly. Do mythological shows undermine a father's love?